At Powell Dental Sleep Solutions, we take the word solutions very seriously. Rather than just telling you about a singular treatment for sleep apnea and snoring, Dr. Shelley will tell you about everything available today. That way, you and your sleep doctor can determine the best option for you. One of the least known treatments is Inspire UAS, which doesn’t require a patient to wear a mask or oral appliance to bed. Could it be right for you? Read on below to learn more. How Can Powell Dental Sleep Solutions Help with Inspire UAS Therapy? The tongue plays a significant role in obstructive sleep apnea (OSA) during sleep. When the muscles relax, the tongue can fall back and block breathing in the throat. 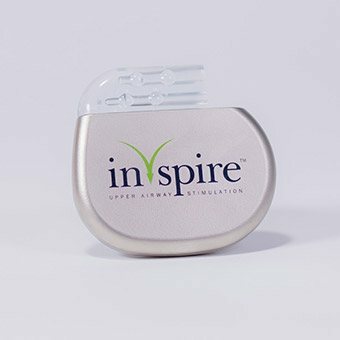 Inspire UAS is a medical system dedicated to helping persons who do not tolerate or receive benefit from traditional therapies such as CPAP, oral appliance therapy (OAT), or surgery in the treatment of OSA. Studies in the New England Journal of Medicine showed that 2 out of 3 patients who received Inspire UAS achieved a dramatic improvement or resolution of their sleep apnea. In addition, 85% of patients had no or soft snoring! Could You Benefit from Inspire UAS? There are 3 steps involved in determining whether you are a good candidate for UAS therapy. First, you must have OSA and not had success with CPAP therapy. Second, an evaluation with a sleep physician is needed to determine the likelihood of its potential effectiveness. 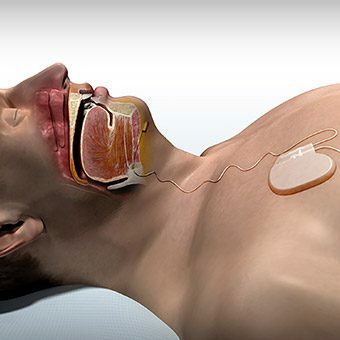 Thirdly, a short evaluation procedure called drug-induced sleep endoscopy (DISE) is performed under sedation so a surgeon can examine your airway and provide an expected outcome with the device. Occasionally, patients with severe obstructive sleep apnea are unable to obtain completely effective results with only one therapy. For those patients, combination of therapies are ideal. Powell Dental Sleep Solutions will assist their patients with obtaining combination therapies such as Inspire and oral appliance working together for more efficacious results. 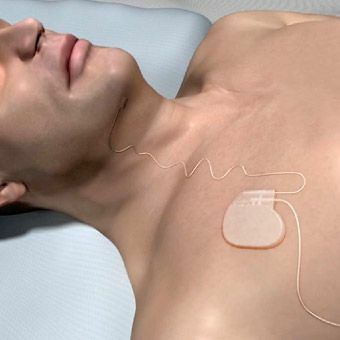 The treatment involves a surgical procedure to place an implant inside the body, and a patient will receive a remote control to turn on the device when they go to bed and turn it off in the morning when they wake up. The procedure requires a dissection of the nerve responsible for tongue movement, the hypoglossal nerve. It does not require a mask or anything to wear at night. There are slight risks to this procedure, and your physician will thoroughly discuss this option with you.